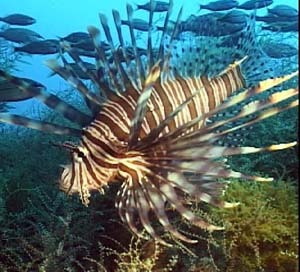 According to the Galveston Daily News, the lionfish invasion has officially arrived in Texas waters. After years of dominating the Atlantic Ocean and Caribbean Sea, it was only a matter of time before the fish moved farther west into the rich reefs of the Flower Garden Banks National Maritime Sanctuary, a popular diving spot just 100 miles south of the Texas-Louisiana coast line. Three separate lionfish were recently spotted on the reefs of the Flower Gardens, and it has many researchers and state officials concerned. The Pacific-originating lionfish have no known natural predators in this half of the world, so their numbers usually explode as they gobble up all of the local marine life. The fish are indiscriminate predators with strong enough defenses that deter most predators. Because of this, the lionfish can eat many commercially and environmentally important fish such as juvenile groupers and parrotfish. The three individuals spotted recently were all juveniles, and it is assumed that they all came in on the currents, which is the common method for larval and juvenile dispersal among fish. Besides the healthy reefs of the Gulf of Mexico, the thousands of oil rigs will also provide rich hunting grounds for the fish and will probably serve as brief stopovers as the fish continue to populate the gulf.